Some runners commented that the underfoot cushioning of the Hoka One One Torrent felt suitably comfortable. The spacious toe box allowed natural toe-splay, according to several user reviews. Most wearers welcomed the reliable traction of the Torrent. Several purchasers noticed that the shoe drains quickly. The sizing scheme conformed most user’s expectations. Many admired the shoe’s durable construction; one user said that after running 100 miles it still performed well. A couple of users experienced heel slippage with the Hoka One One Torrent. Because of the missing rock plate, a few felt the sharp rocks while running on trails. The Hoka One One Torrent is a neutral trail running shoe with responsive cushioning. The shoe was mostly well-received by its purchasers because of its comfort, lightweight construction, traction, and overall performance. The minor issues on heel slippage and missing rock plate are not enough to overshadow the positive feedback. Overall, the Torrent is indeed a successful release. The Torrent is my second running shoe from Hoka One One. The first pair I had was given to me by a friend, and I was not impressed by the shoe’s performance. The upper of the Hoka One One Torrent features a durable engineered mesh which aims to deliver breathability and comfort. The mesh is stretchable which gives the foot a nice wrap, and it has a quick-drying feature, keeping the foot dry and cool. For added support and foot protection, seamless overlays are added to the shoe. The overlays are light, and since it is seamless, it does not create blister or irritation. To secure the foot while running, the shoe utilizes a traditional lace-up closure. The laces are flat and stretchable; they stay in place throughout the run. In the midsole is the dual-density PROFLY technology. It is a lightweight midsole foam designed for responsiveness and flexibility. Durable underfoot protection is also another characteristic of the PROFLY midsole. For durability and traction, the Hoka One One Torrent makes use of a high-abrasion rubber material. The durable material covers the entire outer sole, and it features multi-directional lugs strategically placed for reliable traction on varied trail surfaces. The Torrent is average when it comes to comfort. I have been wearing the shoe with thin socks, and so far, I found it comfortable (but not exceptionally comfortable). I’m just happy that the cushioning is not too firm and that I develop no blister or hot spot. The upper mesh is not breathable too, making the shoe not ideal for hot weather. It wraps the foot smoothly, but after an hour of wearing the shoe, my feet were sweating a bit. I haven’t experienced this with my other trail shoes. I’ve been using the shoes for a couple of months, and I think the Torrent is a well-rounded trail shoe. The shoe does not disappoint when used use on rocky trails and muddy surfaces. The lugs are consistent and aggressive. The cushioning of the Hoka One One Torrent is responsive. I love the extra cushioning in the heel and the firmer feel in the forefoot area; this is exactly what I am looking for in a trail shoe. The major problem I experienced with the Hoka One One Torrent is the fit. It is true to size, but I find the fit too tight for my liking. The heel is stiffer, and it is narrower than expected. It gave a slight pressure while running. The forefoot is also narrow but not too tight to cause discomfort. The toe box gives no room for toe splay. As a trail runner, I prefer a roomy toe box. Just like the other Hoka One One models, the Torrent is a durable trail shoe. The outsole features a high-abrasion rubber material. Impressively, after running 100 miles, the outsole looks the same - no sign of wear and tear. The upper mesh material is also mighty durable. Performance-wise, the Hoka One One Torrent is truly a game changer. However, the overall fit needs improvement. It is durable, responsive, and the traction is remarkable. The Torrent fits into Hoka’s lineup as a lightweight and protective distance racing shoe, doubling as an excellent trail shoe for faster runs. The Hoka Torrent was the primary trail shoe in my rotation this fall, seeing use in runs ranging from easy distance to mile repeats on grass. 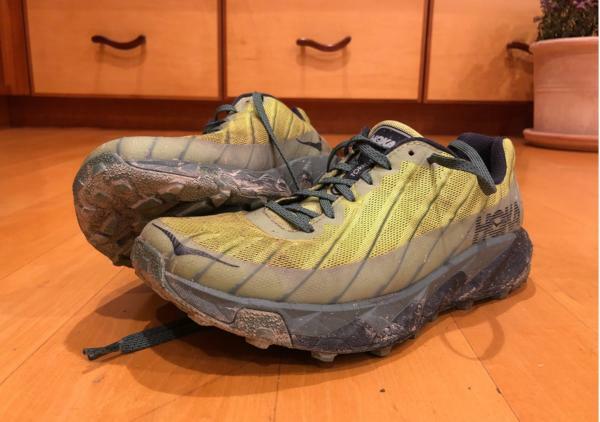 The Torrent improved upon the Hoka Speed Instinct 2 (my previous primary trail shoe) in nearly every category, making it one of my favorite shoes of 2018. The Torrent keeps the winning formula of the previous Speed Instinct and Speed Instinct 2, it improves upon those shoes in a few key components. The simplified upper and significantly improved outsole fix the two complaints about the Speed Instinct series - durability and traction. While improving on these two areas, the Hoka Torrent manages to lose half an ounce, dropping from 9.5 oz to 9 ounces in a US men's size 9. Also, the Speed Instinct utilized a stack height of 22mm and 25mm in the front and rear, respectively. The Torrent lowers it to 19mm and 24mm, for a more aggressive, race-ready ride. Therefore, the Hoka Torrent is a neutral shoe, meaning those who over or under pronate should consider another shoe. Possibly the most notable upgrade from the Speed Instinct 2 to the Torrent is the improved upper design. The Hoka Torrent utilizes a breathable engineered mesh upper, with dynamic TPU overlays, running diagonally across the midfoot, as well as TPU overlays surrounding the toe for enhanced protection and durability. The entire upper is relatively stiff and provides an aggressive locked down fit while remaining comfortable for hours of activity. When traversing technical terrain, the shoe remained stable, and I experienced no slippage in the midfoot or toebox. I did find the heel to be a touch roomy for me as I have a very slim heel and ankle. But this issue was quickly rectified by using the second set of lace eyelets. While running in a heat spell in early September, the shoe breathed exceptionally well. I did not experience any issues with my feet overheating. Due to the simplified overlays and more durable mesh, the Torrent’s upper is noticeably more durable than the Hoka Speed Instinct 2. The Hoka torrent uses Hoka’s PROFLY midsole, which is made up of EVA foam. While the Torrent does not introduce any radical midsole technology, it provides an excellent balance of cushioning and responsiveness needed in a distance racing shoe. The Torrent was comfortable enough to log easy miles in, yet still had the necessary speed and responsiveness for use in interval workouts or racing. Like the rest of Hoka’s lineup, the Torrent employs Hoka’s Meta-Rocker geometry, making it one of the best transitioning trail shoes I’ve run in. As a forefoot striker, I found this shoe glided through every step, with the stiffness of the midsole providing a satisfying snappiness, especially at speed. When racing in this shoe, it easily kept up with an aggressive turnover and its responsiveness aided in my finishing kick. Personally, I gravitate towards stiffer shoes as I enjoy the added snap, but the Torrent might not be right for people who prefer a flexible and natural feeling shoe. While I do like the responsiveness and found it to be comfortable, I occasionally wished the Torrent had a little more cushioning, or a slightly softer top layer, as it is noticeably firmer than many other Hokas. However, The Hoka Speedgoat 2 and 3 retain numerous characteristics of the Torrent, but with an additional 5mm of stack height. While the torrent was a little firm for easy runs, it is currently my favorite trail shoe for racing and workouts, while remaining comfortable for miles on end. The primary complaint I had with the Hoka Speed Instinct 2 was the outsole as performance in wet and loose conditions was underwhelming. The outsole of the Torrent is completely redesigned and performs significantly better in nearly all conditions. While the Speed Instinct used small lugs without much purchase, the Torrent uses large, angular, and aggressive lugs, which dig into nearly any surface.The outsole on the Torrent performed well in nearly every condition I tested it in, excelling in hard-packed dirt trails, mud, wet grass, and rocky technical trails. I found the outsole of the Speed Instinct held it back from being a do it all trail racing shoe, whereas the outsole of the Torrent performs well in a variety of difficult conditions. While the Torrent’s trail performance significantly improves upon the Speed Instinct, it is best to keep it as a trail shoe, and not take it on the road. While running in the Speed Instinct, I found I could run on dirt roads comfortably. Whereas the Torrent feels a little too stiff and aggressive for use on roads. I do not see this being an issue, as the Torrent was designed specifically as a trail shoe, and road performance is not important for this shoe. Overall, the Hoka Torrent is an excellent aggressive trail shoe and improves upon the already good Hoka Speed Instinct 2 in nearly every way. Improvements, such as a simplified upper and significantly more aggressive outsole pattern, make this one of my favorite trail shoes of 2018. After logging hundreds of miles in the Speed Instinct 2, I was generally quite impressed but did have a few criticisms, particularly with the outsole. The Torrent fixes just about all of the issues I had with the Speed Instinct 2, while also making the shoe lighter and less expensive. While many brands add additional features and raise the price, it is refreshing to see Hoka improve a shoe and lower the price. Although I have not run as many miles in the Torrent as I did in the Speed Instinct 2, the durability appears to be excellent, and the shoes are only showing minimal signs of wear. The Torrent proved to be a highly versatile shoe, useful for speed workouts all the way up to longer easy runs and distance racing. I would highly recommend this shoe to anyone looking for a light and fast trail shoe with enough cushion to stay comfortable over long distances. This is a great new versatile trail shoe from Hoka One One. Lightweight, fast, responsive ride. Still, I love the cushion and support that the midsole offers. Hoka One One boasts of a running shoe that is formed through a collaboration with world-class athletes – the Torrent. Just like the popular Hoka One One trail shoe, the Speedgoat 3, this shoe is designed for race day, as it offers a unique combination of agility and cushioning. The versatile and sleek design of the Torrent enables neutral runners to achieve a speedy ride and more miles. The open-engineered mesh upper provides optimal breathability and delivers a quick-dry and comfortable foot environment. It displays a minimal layout yet gives a secure fit. Through the PROFLY™ midsole, the shoe is made user-friendly as heel strikes are more natural and toe-offs are bouncier. The midsole unit is coupled with an outsole that produces high-level traction, making the Hoka One One Torrent a nimble and adaptable running shoe. In the outsole of the Hoka One One Torrent is the hi-abrasion rubber zones which gives the shoe durability without adding too much weight. Incorporated into the outer sole are the multidirectional lugs which are designed for excepetional grip on varied surfaces. The Hoka One One Torrent is constructed with a standard running shoe width and length. However, runners who have a high foot volume might find the shoe to be a little narrow in the forefoot. Wearers who are accustomed to Hoka One One shoes will discover the Torrent to have a similar fit. The Torrent is available in D – Medium for men and B – Medium for women. The aggressive rubber outsole of the Torrent enables gripping and digging into various outdoor surfaces with ease. The heel and forefoot areas are reinforced with a high-abrasion sticky rubber for durability. It can survive even the toughest route. The Torrent has deep, prominent lugs that work capably in supplying multidirectional traction. These lugs help the runner undertake soft, messy trails with no problem. The lugs also give added flexibility to the shoe. Hoka One One presents the PROFLY™ midsole technology in the Torrent, which is a dual-density foam compound that is formed soft in the heel and firm at the forefoot. This layout reduces pressure when landing on hard, rocky terrains, but, at the same time, produces light and bouncy toe-offs. As a smooth transition is generated, the runner is able to log more miles, thus completing the PROFLY™’s concept of balance between protection and propulsion. The PROFLY™ compound comes in the form of an oversized ethylene-vinyl acetate (EVA) unit that delivers an adequate underfoot cushioning but without the additional bulk. The upper of the Hoka One One Torrent is a breathable mesh with a stripped-down design. This material offers lightweight comfort that promotes a comfortable running experience. The mesh also has a quick-drying capability, encouraging a healthy foot environment as it eliminates moisture buildup. A set of overlays surrounds the upper in strategic locations. These synthetic elements protect the forefoot and toes from debris while supporting the rest of the shoe by providing a structural framework. The overlays are in seamless design, it gives the foot a smooth and irritation-free environment. The tongue and heel collar of the Torrent is moderately padded. The foam padding remains to be smooth for added comfort. The heel collar and tongue also enhances the overall fit and foot lockdown. To secure the foot while running, the shoe has a lace-up closure. The laces are durable and they stay tied while running. There are extra eyelets to further secure the ankle and heel area.